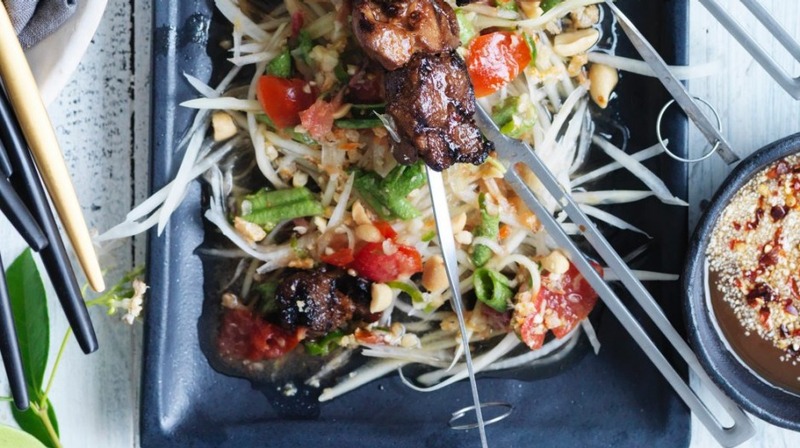 This simple, Thai-style salad is great on its own or as an accompaniment to a meat dish. 1. Using a large mortar and pestle, crush garlic and tomatoes, add chillies and crush lightly. Pour in liquids, then palm sugar and stir to dissolve. 2. In a separate bowl, gently bruise the snake beans and the papaya and mix together. 3. Drizzle papaya and beans with dressing and garnish with roasted peanuts and dried shrimp.